1. Identify each sample area legibly and indelibly on the margin of slide. 2. Mix samples with a vortex 25 times. 3. Heat samples in a water bath to 30-40°C. 4. Vortex the samples again. 5. Mix them carefully and cool to the temperature at which the microsyringe has been calibrated. 1. Place 0.01 mL of milk sample on a clean slide in a 1-cm2 area. 2. Holding the microsyringe vertical, place the tip near the center of the area to receive the smear, touch the slide with the tip, and expel the test portion. 3. With the plunger still fully depressed, touch once against a dry spot. 4. Release the plunger only after touching and removing the tip from the slide. 1. Dry the sample in a heat source regulated at 40-45°C and fix it in Carnoy's fixative solution for 5 min; then was hydrate the film for 1 min each in 50% ethanol, 30% ethanol, and distilled water. 3. Dry the film completely, immerse in butanol and distilled water for 1 min each, and dry again. 1. Examine the smear microscopically. 2. Adjust the microscope lamp to provide maximal optical resolution. Place one drop of immersion oil on the smear, carefully lower the oil immersion lens, focus, locate the center of the microscope area, and begin counting cells. Cells stain blue or blue-green; RNA and background stain pink. 3. Count all cells in a field-wide strip across the diameter of a single smear, focusing up and down as necessary. Cells are generally 8 ^m or larger; do not count cells less than 4 ^m, and count fragments only if more than 50% of the nuclear material is visible. Clusters of cells must be counted as 1 unless nuclear unit(s) are clearly separated; focus up and down to ensure that there are no bridges connecting nuclear masses. Count cells touching only the top or bottom half of strip. If in doubt, do not count. 4. Based on values taken from different researchers (1,8,12-15), a count between 1.0 and 1.3 x 106 cells/mL can be accepted as the limit between infected and noninfected milk. 5. Each analyst measures the field diameter and calculates the SSF, rounding to three significant figures. When this technique is used for the first time, the values obtained must be compared with those obtained by the SCC method, fixing the somatic cell level for infected and noninfected animals and between different degrees of infection (see Note 4). Based on this comparison, the p-glucuronidase activity levels can then also be established for the same categories described above. Values between 0 and 100 U of p-glucuronidase are determined and a value of 15 U is fixed as the limit between infected and noninfected milk (1). Next, the false-negative and -positive values obtained by comparing the p-glucu-ronidase method with the SCC method must be identified. Thus false positives of 6% were established for goat milk (samples showing low SCC levels but higher p-glucu-ronidase levels than the established limit owing to false-positive results or other factors; see Note 5) (1). On the other hand, false negatives of 12% were thus established (samples showing high SCC levels but with p-glucuronidase levels lower than the established limit) (1). This technique will allow identification of clinically or subclinically infected animals. Thus interference and errors produced by counting the normal nonleukocytic cell-like particles characteristic of goat milk will be eliminated. 1. It is advisable to remove milk fat from the milk samples before analysis by cool centrifu-gation. The grease remains in the upper part of the tube and can be easily taken away with a clean spatula. If not removed, it will interfere with the spectrophotometer measure. 2. It is convenient to include a blank for each sample of analyzed milk that contains the same milk sample but is not incubated, because each sample has a different fat content and therefore the fat taken away from each one will be different. 3. Use disposable plastic gloves to handle stains. 4. The California Mastitis Test can also be used for comparing with the ^-glucuronidase method. It is faster but less reliable. 5. The number of somatic cells in milk may be increased when goats are in different lactation stage, are subjected to stress, or have undergone recent parturition. 1 Oliszewski, R., Núñez de Kairúz, M. S., González, S. N., and Oliver, G. (2002) Assessment of ^-glucuronidase levels in goat's milk as an indicator of mastitis: comparison with other mastitis detection methods. J. Food Prot. 65, 864-866. 2. Parisi, A., Sanna, A., and Caria, A. (2000) Raw materials: quality and pricing. Proceedings of the Conference on Development Strategy for the Sheep and Goat Sector. Bulletin of the International Dairy Federation 354/2000, Brussels, Belgium. 3. Shearer, J.K. and Harris, B. Jr. (1992) Mastitis in dairy goats. University of Florida, Gainesville, DS 85. 5. Dulin, A. M., Paape, M. J., and Wergin, W. P. (1982) Differentiation and enumeration of somatic cells in goat milk. J. Food Prot. 45, 435-439. 6 Wooding, F. B. P., Peaker, M., and Linzell, J. L. (1970) Theories of milk secretion: evidence from the electron microscopic examination of milk. Nature 226, 762-764. 7. Perdigon, G., Medici, M., Oliver, G., and Pesce de Ruiz Holgado, A. A. (1988) Relationship between ^-glucuronidase levels and cells counts in bulk milk. Milchwissenschaft 43, 25-26. 8. Zeng, S. S., Popham, T., and Escobar, E. N. (1999) Seasonal variation of somatic cell count and chemical composition in bulk tank goat milk. Dairy Food Environ. Sanitation 19, 685-690. 9 Schnyder, D. and Bagglioni, M. (1978) Secretion of lysosomal hydrolases by stimulated and non-stimulated macrophages. J. Exp. Med. 148, 435-450. 10 Schorlemmer, H. U., Burger, R., Hylton, W., and Allison, A. C. (1977) Induction of lysosomal enzyme release from culture macrophages by dextran sulfate. Clin. Immunol. Immunopathol. 7, 88. 11. Csapó, J., Csapó-Kiss, Z., and Stefler, J. (1995) Influence of mastitis on D-amino content of milk. J. Dairy Sci. 78, 2375-2381. 12. Páez, R. and Maggio, A. (1997) Leche de cabra: un camino hacia la calidad. Infortambo 104, 132-134. 13. Tietze, M. and Majewski, T. (1995) Somatic cell count in cow, ewe and goat milk. Annales Univesitatis Mariae Curie-Sklodowska. Sectio EE Zootechnica 13, 145-149. 14. Fahr, R. D., Schulz, J., Finn, G., Lengerken, G. V. and Walther, R. (1999) Total and differential somatic cell counts in goat milk. Variability and influencing factors. Ausgabe G. Grosstiere/Nutztiere 27, 99-106. 15. 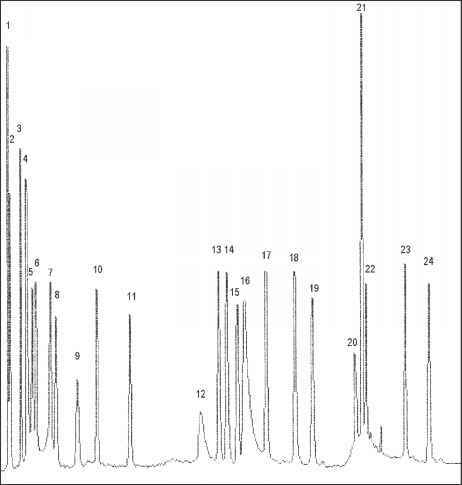 Poutrel, B. and Lerondelle, C. (1983) Cell content of goat milk. California mastitis test, Coulter counter and Fossomatic for predicting half infection. J. Dairy Sci. 66, 2575-2579. What to count in direct microscopic somatic cell count goat milk slides?